Well I had very high hopes for this book, but I should have known that I was never going to enjoy it. Pride and Prejudice is one of my favourite books of all time, and as promising as a sequel sounds, it was never going to live up to the brilliance of Austen. But not only did this book not live up to expectations, it also made me shake my head in disapproval at some of the things that were happening or supposed to have happened in the six year gap between the end of Pride and Prejudice and the start of this book. The thing that made me most annoyed was that James kept referring to the fact that Elizabeth only married Darcy for his money and the quality of the situation at Pemberley, at one point saying ‘Elizabeth knew she was not made for the sad contrivances of poverty’. Well I always believed that Elizabeth was able to look through all Darcy’s supposed faults and his hard outer shell to fall in love with the person inside, and I didn’t like reading a book which suggested that their marriage was made from anything other than mutual love, affection and respect for each other. This sounded pretty promising, I was not a fan of Wickham and as I knew that this was a murder novel, I was quite relieved that it wasn’t my beloved Elizabeth or Jane that were being knocked off. But alas, all was not as it seemed, and it was poor Denny who had bitten the dust. But with Wickham the prime suspect, all was still promising, but not for long. The thing that I disliked most about the book was the amount of what seemed to me like filler, it took until about 80% through the book until the trial of Wickham, which then seemed incredibly rushed with a lack of detail. It was also written in modern language, rather than sticking to the beautiful, flowing language of Austen, although if James had attempted that, it may have made things worse. As for the eventual revelation of the true culprit, I found it a strange choice of character. The motive, although fully explained at the end of the book, didn’t seem to tie in too well to the setting up of the story at the start, and was not what I would have picked if I had been writing this story. 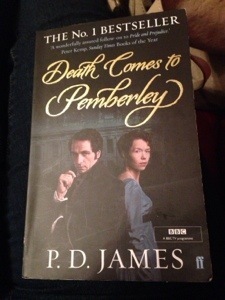 I wanted to read this book before the BBC TV adaptation starts on the TV tonight, and while I’m glad I read it before watching it, and while I will still watch it to see what it’s like on the screen, I would rather have spent the last few days re-reading Pride and Prejudice.